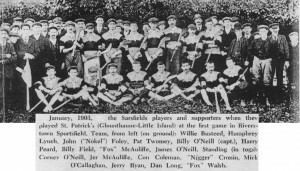 In 1894 a group of men led by Billy O’Neill of Sarfield’s Court established Sarsfields GAA Club. We cannot produce documentary evidence that a club called Sarsfields was first formally registered in the year 1896. But we do know that organised matches were being played by Riverstown hurlers in the ‘Pike Inch’ field under the parish church of Glanmire in that year, and before long Billy O’Neill and his loyal companions had completed the organisational formalities. Today our admiration’s is drawn to the more youthful grades of the club. Their prowness and many victories that have re-enkinded pride in the present and high hopes for the future. But the most abiding memories of all are the never-to-be-forgotten County Final of 1951 in which Sars stalwarts emerged victorious after half-a-centry of untiring club perservance, and the repetition of that glorious performances in 1957. It’s base and cornerstone has always been Riverstown, five miles from Cork on the road to Dublin and in the parish of Glanmire. But its area stretches from Dunkettle Bridge to Watergrasshill and from Dillon’s Cross in the city to Glounthane. Or, it’s territory might be described as the valley of the Glashaboy River, which includes the district of Carraig na bhFear, Upper Glanmire, Knocknahorgan, Templemichael, Sallybrook, Riverstown and Glanmire Village. In the whole parish of Glanmire there is not a more historic residence than Sarsfied’s Court, a lovely dwelling on a picturesque eminence overlooking the lower reaches of the Glashaboy. It is the home of the famed O’Neill family in the centre of Sarsfield’s Court that we are concerned with. Their present house has stood since the middle of the last century. Adjacent to the it are the ruins of the ancient ‘Court’, once the home of an honoured branch of the Sarsfield family, kinsfolk of the renowned Patrick Sarsfield, Earl of Lucan. It was passed from the Sarsfields to the O’Neill’s many of generations ago. And so we come to William O’Neill, son of John, grandson of Con, who was born about 1876 and who was destined to become principal founder of Sarsfields Hurling Club. The ancient Irish game of ‘goaling’, as hurling was formally called, was no stranger to the Glashaboy valley. The poets of Carraig na bhFear had sung about it in the 1700’s and at the other end of the district, Caherlag’s men reigned supreme for years. But, strange to relate, as GAA times approached, it was Gaelic football which was the favourite game of Glanmire parish, at least of the northern half of it, and the very first inter-county Gaelic football match played in Cork under GAA rules was Glanmire (representing Cork) against Fethard (Tipperary) at the old Cork Park on August 29th, 1886. The game was un-finished due to fading light. There are several theories as to the actual manner in which Sarsfields came into existence. Sean O’Neill (Son of Billy) believes that it was after an inter-county fixture at Dungarvan in both football and hurling that his father, having played in the former, boasted that the Riverstown lads pucking the ball around the ‘Pike Inch’ would do better than the hurlers on view. And to make his boast, he soon rallied the McAuliffe’s, Ryan’s, Buckley’s, Turpin’s, Peard’s and Walshes around him to form a team. The O’Briens club put up the money for the registration, so as the story goes. Another theory says that it was returning from a O’Briens match in North Cork that the decision was made. Other early traditions are that the decision to form a club was made at a small bridge (still there) just below Sarsfields Court and that the first formal meeting was held in the home of Jer Curtin nearby. There can be little doubt who suggested the name “Sarsfields”. Certain it was that man like Jer and Jack McAuliffe, Stephen Turpin, the Curtains, the other O’Neill brothers, John Foley, Denis Buckley and others soon formed the nucleus of a very keen club, and the idea of meeting the great from the parish brought a new dimension to those rugged gallant hurling sessions in the ‘Pike Inch’ on the river’s bank under Springhill church. We know little about the early matches played by that first Sars team. 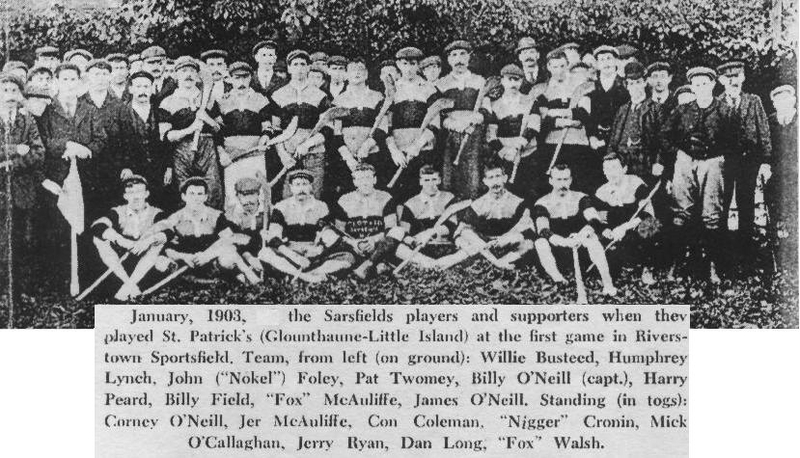 Blackrock were the first of the ‘giants’ to inflict a crushing defeat on them, but with the turn of the century the name Sarsfields was coming to be better known, and a memorable victory over Redmonds in connection with the famous Cork Exhibition of 1902 stamped them once and for all as a team to be reckoned with. The first big development of the new century was the transfer of playing activities from the ‘Pike Inch’ to the new Riverstown Sportsfield, which was officially opened in January 1903. The Canavan family had joined the Sarsfields at a very early stage, and the field behind the Castle Tavern was an ideal venue for the expanding programme of the club. Despite Sarsfields close association with the pitch, it was a separate committee which was established to develop ‘the grounds to enclose a suitable grounds for athletic and tournament purposes’.